The destination restaurant at The Broad will have a lot of Grand Avenue community involvement. Its front door step will be a magnificent public park. Movie screenings there are already in the plans. Be watching for an early Summer of 2015 opening. Segment Two: Chef Brandon Boudet, Dominick’s and Little Dom’s, Los Angeles. Eat LBC – Long Beach Restaurant Week kicks off on March 30th. 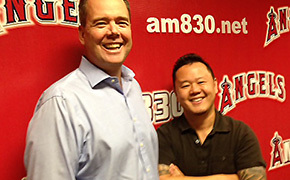 Executive Chef Dean James Max of James Republic in Long Beach is with us to preview his menu. When it comes to elegant, destination resorts they don’t come more highly acclaimed than Little Nell in Aspen, Colorado. Carlton McCoy (an accredited Master Sommelier) is their 29-year old Wine Director. We’ll hear his inspiring story. Organic fruits and vegetables are top of the mind. Our resident Professor of Produce, Robert Schueller from Melissa’s, is back with an informative update on organics. Chef Jet was a Judge at last Sunday’s Cochon 555 – An Epic Heritage Pork Event at The Fairmont Miramar Hotel in Santa Monica. Jet takes us behind-the-scenes at this eagerly anticipated and highly competitive event that tours the country. Chef Brandon Boudet is the co-owner and head chef for Dominick’s and Little Dom’s. He’s a proud native of New Orleans. Each year Dominick’s and Little Dom’s celebrate Mardi Gras and Fat Tuesday in true Bourbon Street Style. On their menu are special cocktails, bites and of course, Jambalaya and red beans and rice. Chef Brandon explains the mysteries of the King Cake. Coming up in May are two Saturdays of crawfish boils. James Republic combines modern sensibilities with old-world principles to afford a genuine gathering place for the neighborhood and a distinctive dining destination in the heart of Long Beach. Weekend brunch on the patio is a popular attraction for the locals. The style of food at James Republic is what they call “modern California coastal” dining. The goal is to highlight the season’s vibrant, locally sourced bounty from both the land and sea. 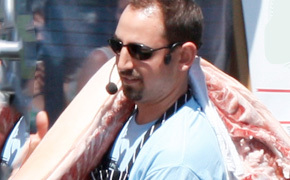 In Los Angeles Chef Max is remembered as the owner/chef of Woodside in Brentwood in the late 90s. It was highly regarded and well-reviewed. Mar Yvette is the Lifestyle Reporter for Fox 11 News right here in Los Angeles. We’re talking about cuisine worthy of Oscar! For the 20th year Wolfgang Puck and his highly talented team of chefs and associates will prepare the exquisite menu for the 2014 Oscars Governor’s Ball held in the Ray Dolby Ballroom on the top level of the Hollywood & Highland Center. We’ll preview the menu! Think 1,250 Stone Crab claws for the 1,500 invited guests. Mar also highlights some of the hidden restaurants in Los Angeles where the celebrities go to simply enjoy the great food and not be noticed! Mar points out that the celebs love the restaurants in luxury hotels. Think Culina Modern Italian at The Four Seasons Los Angeles at Beverly Hills. Donato Poto is the ever-gracious, “Mr. Hospitality,” when it comes to seasoned restaurant General Managers on the volatile Los Angeles dining scene. He speaks three languages including Italian, French, and English. Today Donato is a partner in both Connie & Ted’s in West Hollywood and Providence in Hollywood. Connie & Ted’s was just selected as a Semifinalist for the James Beard Foundation Award for Best New Restaurant. His business partner, Chef Michael Cimarusti was also recognized as a semifinalist for The James Beard Foundation Award for Best Chef: West for Providence. Donato’s other partner in Connie and Ted’s, Craig Nickoloff, founded the hugely successful Claim Jumper Restaurants. Our resident Professor of Produce, Robert Schueller of Melissa’s World Variety Produce, is back with us to discuss what’s new in organics. Melissa’s is the largest variety supplier of fresh organic produce in the USA. All the varieties of organic Kale are the hot item in produce right now. Organic Pixie Tangerines (easy to peel and sweet) are leading the charge in fresh citrus. The COCHON U.S. Tour events serve as a link to preserving heritage breed pigs by promoting breed diversity in communities nationwide. The coast-to-coast tour connects ranchers raising heritage breeds with top chefs known for whole animal utilization. The Los Angeles stop of the Cochon 555 tour was Sunday, Feb. 23rd at the Fairmont Miramar Hotel in Santa Monica. Five Chefs worked with five heritage pigs in an intense competition. Chef Ray Garcia of Fig Restaurant was the defending champion. Our own Chef Jet Tila was a judge. He also cooked the heritage pig for the After Party (Cochon Late Night Asian Speakeasy.) The heritage pig was a Kune Kune (they like to feed on grass) from Rainbow Ranch Farm.